Three years ago, Francis Martorella, 68 of North Charleroi, struggled with his weight. At his annual checkup his weight was so high that the scale could not read it. That’s when Francis decided that he needed a game plan to change his life. Francis’s weight had also contributed to several health problems, which included a triple heart bypass and lymphedema. The first step Francis took was putting himself on a 1,300-1,500 calorie diet drinking plenty of water, lean cuisine entrees and exercising at home with a 25 lbs. kettle ball. 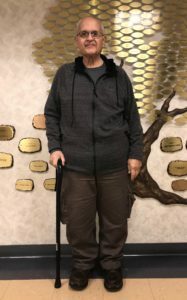 Francis’s nephew suggested his uncle that he should continue exercising at the Mon Valley YMCA and that he might possibly qualify for a free membership through his supplemental health plan. Francis started working out at the Y. His routine consisted of circuit training in the ETA room 3-4 times a week. Francis has lost a total of 113lbs and 8 pants sizes since beginning his journey. He gives credit to Peggy Herforth and Marnie Martin, fitness trainers at the Y, for their encouragement. He plans to continue his healthy diet and exercise plan. His goal weight is to be 250 lbs. Preschool, Pre K Counts and First Friends are cancelled for Thursday, January 31.Are you working out at our Y?